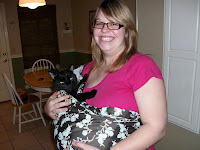 As I mentioned in this post yesterday, I used my cat as my "test baby" in order to see if I was using my new sling properly. He was a pretty good sport about the whole thing, and we even managed to get some pictures of him! 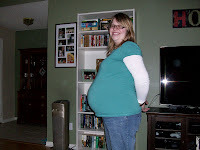 Here are also a few shots of me at 39 weeks. For some reason my eyes are closed in the last picture. I think Jason planned it that way! To put this into perspective for you... i.e. how big I actually am, my chest size is about a 38DD. My sister-in-law made a good point, finally my chest doesn't look so big! (Thank God!) So, yes, that is a VERY big belly! Oh my goodness...you're almost done!! That is soo exciting!! 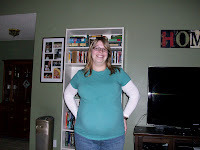 Love seeing preggo pics..too cute and I love you glasses! Thanks Keely! I love my glasses, too. Although I've had them for over 2 years now.. Probably time for a change! I love the cat! 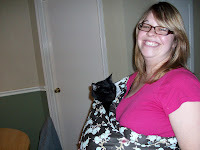 If only ours would stay still long enough to try a sling ... so cute! I hear ya on the chest size. I just went nursing bra shopping today ... I'm not going to share what I measured as! AHHH! I can't believe you're still pregnant! Have you made any more progress since your last status update? I haven't been on FB in a while, I hope I didn't miss anything! The cat pictures are cute! Love the belly pictures too! I'm excited to hear if it will be a boy or girl (...and see pictures!) I can't think of anyone I know that's had a baby in the past decade that did not find out. It is truly exciting! Elizabeth- not much more to report on the baby front. No more dilation, but I am now 75% effaced. That's all though... baby is due Sunday. I'm not sure he/she will be here by then! Oh my gosh! He the kitty looks so cuddly in that thing! My cats would scratch my eyes out.